What a brilliant book! I sadly regret not reading the trilogy of the Word Hunters. This book was created as a companion to that series. It is an exceptional book full of the history of letters and words, their discovery and definition, reconstruction, and ancient origins. I learned so much from this book, especially about the origins of terms used in cricket, and many stunning sports facts of which I knew very little. 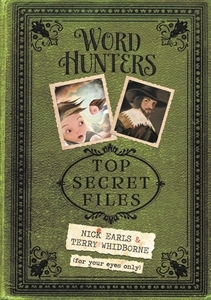 Top Secret Files reveals information about the Word Hunters’ quest to save lost words, recover obsolete ones, and resurrect others that have evolved through time. Lexi, Al, Mursili, Will, embark on adventures into the past through portals. They chronicle their travels as they search for letters and words, sometimes in languages other than English that have morphed into something else through use, misuse or neglect, and help them on their journey back into the dictionary. The travel narrative includes instructions on how to make things such as armour, and recipes from way back in time (which my recipe-hunting self quickly copied). I am convinced the book’s purpose is not only to entertain and inform, but to encourage readers of all ages to look at words, their origins and evolution, with interest and respect, and within an historical context. The spectacular stories connected to the words and their definitions add uniqueness to the whole production. I felt I was experiencing an extended yet riveting historical documentary. The text is in differing fonts, accompanied by many detailed drawings of the unusual objects they are describing. Colour is used discreetly so the reader’s attention remains focused on the words. All is set out in a singular layout on beautiful paper. The covers are eye-catching as are the end pages which portray the characters on a card design. I know that many parents will enjoy sharing Word Hunters with their children. This excellent and well-constructed book is not to be missed. More fun can be had by downloading the free LAYAR app.